R5 will be taking part in Echoes of Hope Charity Events in Park City, Utah on January 24th and 25th. Join R5 alongside Five for Fighting, Matisyahu, Taylor Dayne, and Jessarae for an incredible night of music benefiting Echoes of Hope on the evening of Saturday, January 24th from 8pm to 11pm MST during the Sundance Film Festival. Organizers will be hosting a night of music you won't forget at the Canyons Resort and all proceeds benefit Echoes of Hope. Click here to learn more and to get your tickets for this event. Join Ross, Riker, Rocky, Ryland, and a list of NHL and Hollywood celebrities at the Park City Ice Arena the next day Sunday, January 25th during the Sundance Film Festival in Park City, Utah for the 8th Annual Luc Robitaille Celebrity Shootout from 1:30pm to 3:30pm MST bringing together stars of Hollywood and the NHL for a family friendly day on the ice! Click here to learn more and to get your tickets for this event. It will be a weekend full of music and hockey benefitting a great cause! Will you be attending? With 2014 coming to an end, we take a look back at the journey R5 and the R5Family has taken throughout this year. From R5's first ever world tour, to the announcement of the much-anticipated second full length album, 2014 surely was a big year for R5 and for the entire R5Family all over the world! We take you back to the beginning of 2014 through now and highlight some big events from the year. Here is R5 in 2014, a year in review. The beginning of 2014 started off with the release of the official music video for R5's (I Can't) Forget About You along with the announcement of R5 performing at the 2014 Radio Disney Music Awards. February brought on the announcement of the Radio Disney Music Awards nomination as well as Ross being nominated for a Kid's Choice Award for Favorite TV Actor! March brought on the announcement of R5's first ever intimate concert and meet and greet event. R5 also teamed with Ring Pop and Ring Pop Gummies for the Rock That Rock campaign. R5 also kicked off their first ever radio station tour on the East Coast and the announcement of a show at Wild Adventures Park in Georgia. Ross also took home the Kid's Choice Award for Favorite TV Actor! But the icing on the cake for the month of March was the announcement of the first set of US Tour dates for R5's Louder World Tour! April saw the appearance of R5 on ABC's Live! With Kelly and Michael along with the announcement of R5's performance at the White House Easter Egg Roll event and the band's second appearance on ABC's Good Morning America. R5 also announced more dates for their Louder World Tour in Portugal and their return to London. R5 also made a small appearance on Fox's American Idol alongside host Ryan Seacrest. Seacrest then invited the band on his radio show the following day. A big announcement for Ross as Disney announces the renewal of his show Austin & Ally for Season 4! R5 was also honored at the 2014 Radio Disney Music Awards as they were named Radio Disney's Show Stopper. April also brought more good news for Ross, as Disney also confirms Teen Beach Movie 2! ARDY's Pre-Show Party from the 2014 Radio Disney Music Awards were aired on Disney Channel to start off the month. R5 also announces their performance at the 2014 MDA Show of Strength Telethon. R5 also announced a show at the Sandy Amphitheater. R5 was also nominated to be the next Vevo Lift Artist! It was also announced that R5 was going to appear on The Ellen Show! The premiere of the One Last Dance music video from London was also released, along with a strong message from the band (it was so deep!). June started off with the announcement of more US dates along with Canada shows. R5 and Ring Pop also premiered the Rock That Rock song and music video! R5 also made their second appearance on ABC's Good Morning America performing their single (I Can't) Forget About You. The Teen Choice nominations were also announced and they included Ros, Austin & Ally, and R5! R5 was also nominated for a Young Hollywood Award too! The month of July started off with the announcement of R5's second EP Heart Made Up On You! R5 also teamed up with Office Depot and Office Max for the Gotta Get INSPIR5D campaign for back to school. Although the Fresno show had already been known for a while, it was not officially announced until July. August kicked off with the premiere of the Heart Made Up On You official music video. Ross also took home the Teen Choice Award for Choice TV Actor: Comedy! August also saw the announcement of R5's first South American shows in Brazil and Argentina! The Argentina show was so big, a second date had to be added to accomodate the fans! It was also announced that the 2014 MDA Show of Strength telethon was going to be televised. September started off with some sad news, with the announcement of the release date of R5's second full length album being pushed back to early 2015. But good news followed as R5 was named Vevo's next Vevo Lift campaign. It was also announced that R5 was performing at The T.J. Martell Foundation 6th Annual Los Angeles Family Day. R5 also announced the R5for5 event! New shows were added and announced. It was also announced that R5 was to perform somewhere in the city. R5 alo announced a small, special show in Los Angeles. The end of October brough a very sad announcement of R5's first ever show cancellation. R5 kicks off November with the announcement that they will be performing at the 2014 American Music Awards Red Carpet Pre-Show. 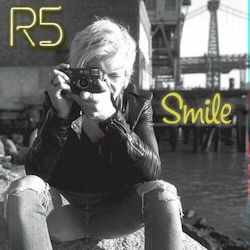 R5 also announces and premieres their new single Smile. R5 also announces their performance at the Salvation Army's Rock the Red Kettle event. December brought the premiere of the official music video for R5's hit single Smile, shot entirely in reverse! 2014 was a big year for R5, but 2015 looks to be pretty promising as well with the release of R5's second full length album, another tour, and more! What's been your most memorable moment of 2014? Are you looking forward to what's to come in 2015? We look forward to sharing that journey with you all! Happy New Year! A very special and happy 19th birthday to the one and only Ross Lynch! What did you think? It definitely made us elimS! Have you been naughty or nice this year? R5 has launched their new promotion for a limited edition R5 logo ornament. 500 ornaments have been made that feature the R5 logo; 250 red and 250 green which fans can purchase for $9.99 each. But, 1 lucky buyer will also receive a lump of "coal" in their stocking in the form of a black ornament that is signed by each member of the band! But you have to hurry, once these ornaments are gone, they're gone! Get yours now! Could you be the lucky buyer? Sometimes it pays to be naughty. Click here buy now! R5 debuted their new single titled "Smile" today on Radio Disney as part of Radio Disney's First Listen with host Brooke Taylor. Teen Vogue later released the video to go with the new single filmed at Teatro Opera in Buenos Aires, Argentina. The new single is available now for download on iTunes in the US and Canada and will release in other territories next week. Click here to purchase your copy now. Watch the music video below. What do you think of the new single?